Currently PRI Central Asia is implementing a project to humanise the criminal justice systems of Kyrgyz Republic and Tajikistan through establishing criminal legislative codes in line with international human rights standards. PRI along with local partners (Golos Svobody in Kyrgyz Republic and Human Rights Center in Tajikistan) organised expert meetings, workshops for local civil society and produced factsheets on alternatives to imprisonment, juvenile justice and on the definition of torture. 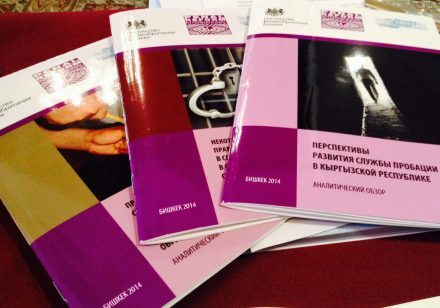 On 17-24 June 2014, a public discussion on the criminal codes was organised in Bishkek. PRI with the financial support of British Embassy in Bishkek, along with a number of international organisations has supported the progress of Working Groups on revised criminal, criminal procedure and criminal executive codes. The aim of the meetings was to evaluate the progress made on the codes to date, and to involve both state officials and local society to learn more about attitude of civil society organisations (CSOs) to the current reform of criminal legislation in Kyrgyzstan. PRI supported pre-session meetings prior to public hearings where PRI experts, Maksim Geta and Igor Slepcov, provided comprehensive and deep analysis of the draft law on the Criminal Executive Code. Special attention was given to the use of alternative sanctions and to establishing a probation service in Kyrgyzstan. In Kyrgyzstan, PRI has contributed to extending the use of alternatives to detention, establishing a proper probation service, and to introducing a legal definition of torture in line with the UN Convention against Torture and providing for sanctions of up to 15 years imprisonment for perpetrators. According to the draft of revised Criminal Executive Code, the time limit for keeping inmates in disciplinary isolators (solitary confinement) will be reduced from seven days to five. Prisons will now be required to react more quickly to orders to make changes to the regime or to commute sentences (within 3-6 months down from 9 months). Juveniles will be able to kept in juvenile correctional facilities up to age 21 whereas previously they had been moved to adult prisons when they turned 18. The specific objectives of the 17 month project supported by British Embassy in Bishkek are establishing a variety of non-custodial sanctioning measures (ie alternatives to imprisonment) including allowing for the establishment of a probation system; reducing violence against children via legislation; definition of torture in line with the UN Convention against Torture and appropriate sanctions for perpetrators are provided for in legislation; engagement of local civil society in criminal reform process.